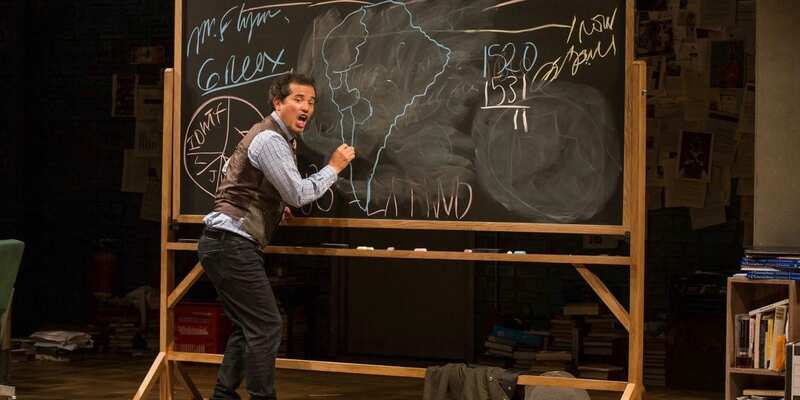 You would have to be a dummy to not go see John Leguizamo’s latest solo show, “Latin History for Morons.” Let me make this simple so that even an idiot could understand — Mr. Leguizamo is one of the most skilled performers out there. He is funny, charming, has a limitless range of voices to portray his multiple characters, and above all, injects his material with a Thanksgiving-size portion of humanity. In Latin History for Morons, we see John’s son getting bullied at school due to his heritage. John pushes him to write a paper about Latin heroes and in so doing educates himself and then in turn us — embarking on a journey from “the Incas to Pitbull.” Filling in this considerable timeline of 1000 AD to the present — chalk in hand, blackboard on stage — Mr. Leguizamo breaks down the genomes, genocides, and genuine contributions of his race. Along the way, he talks to his therapist, fellow parents, school authorities, his Jewish wife, and revisits his past growing up in the ghetto. John is both timeless and topical. There are references to Harvey Weinstein, Trump, and Anthony Weiner. There are explanations of Montezuma, Cortez, and the Aztecs. The historical lessons never become tedious because John is more enthusiastic and spirited than almost any professor you are likely to encounter in your studies; regaling us with hilarious anecdotes and occasionally slipping into mambos and sambas. A minor negative — the many Spanish curse words and phrases that peppered the show were joyously funny to the Spanish speakers but unknown to others. It would have been fun to have been in on those jokes. Will you leave the theater understanding all the Latin history you might have missed in your schooling? Of course not. But by taking this theatrical journey, you will laugh constantly, relate to John’s family, and be more aware of the contributions of the native peoples of the Americas. I for one am grateful they gave us John Leguizamo.